The Green Bay Packers Indoor Club Seats offer climate-controlled comfort and the standard amenities of a private club section at Lambeau Field. The Lambeau Field seating chart shows the Indoor Club Seats on the 400 and 600 level above the north end zone. 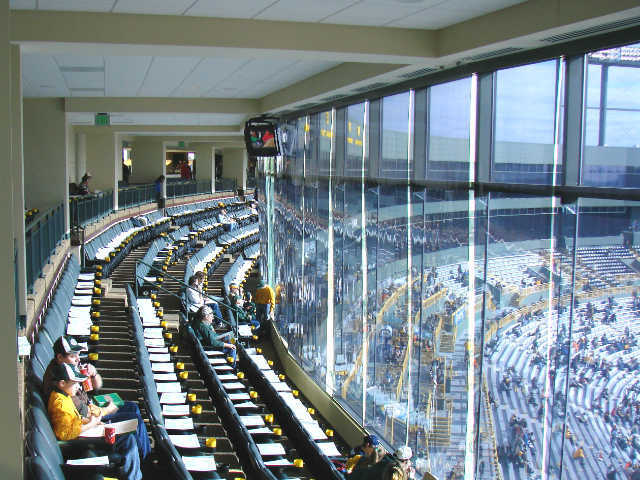 Green Bay Packers Indoor Club Seats are unusual relative to the club seats of other teams because they are located high above the end zone rather than along either sideline. Since the Packers offer an outdoor club section along the sideline, the team decided to sell seats on the upper levels above the north end zone as interior club tickets. The Indoor Club Seats provide upgraded amenities and climate-control during freezing winter months, but the view from high above the end zone is quite poor compared to the sight lines from either Outdoor Club Seats or sections closer to the field. Packers Indoor Club Seats are only sold as full season tickets by the team. The waiting list for club tickets is separate from the waiting list for regular tickets. As such, the current wait list times for full season Indoor Club Seats is under five years. For fans who do not currently own full season club tickets, the only place to buy Indoor Club tickets is the secondary ticketing market. Ticket brokers and third-party Packers ticket websites sell individual game Indoor Club Seats for far above face value for every regular season game. Indoor Club tickets for preseason games are occasionally available for below face value.